Cambridgeshire County Council’s Safer and Stronger Communities Overview and Scrutiny Committee met on Wednesday the 14th of December 2011. The chairman, Cllr Tierney, had invited me to join the committee as a co-optee as I have commented extensively on police and crime related matters, which formed the bulk of the agenda. I arrived at Shire Hall at just before 14.00 and spoke to Cllr Tierney before he entered a private pre-meeting session with the councillors on the committee. I discussed when it would be appropriate to raise some of the items I wished to raise. I asked if any “councillor calls for action relating to crime and disorder and community safety issues” had been received and if councillors had been canvassed to see if they had any matters they wanted discussed. One of the committee’s roles is to consider such requests and make recommendations in light of them. Cllr Tierney assured me that all councillors were aware of the committee’s role and that they could submit items to it but said he didn’t go looking for trouble. I also noted there was no “matters arising” item on the agenda. Cllr Tierney said there usually wasn’t one. Among other things I wanted to note how the Interim Community Safety Countywide Board date had been different to that reported to the last meeting and note the material placed online for that committee was still deficient. 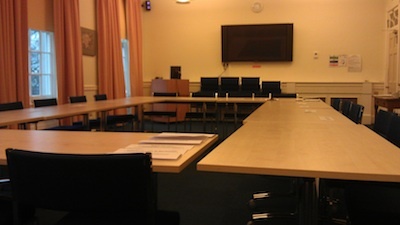 Cllr Tierney and the councillors disappeared off to a room in the bowels of Shire Hall for their private pre-meeting. I waited in the committee room which was one of those at the front of the building overlooking the castle. There was a portrait of the Queen on the wall. There were two rows of public seating and a rectangle of seats for the committee. Committee members entered moments before the start time and took their places. Coffee was available and offered. Cllr Tierney took the chair, welcomed everyone, and then proposed co-opting me to the committee. He explained this was on the grounds of my interest and expertise in some of the matters on the agenda. A vote was held, Cllrs P Brown, Hoy, Reynolds, Pellew, Reeve, Sadiq, West and Whitebread voted in favour of co-opting me. Cllrs Brooks-Gordon and Smith abstained, and there were none against. I was invited to join the committee at the table. Cllr Tierney asked if I had any questions about procedure. I said no. Next up were declarations of interest. I had nothing to declare and I don’t recall anything particularly notable being declared; Cllr Reynolds is a member of the Police Authority; later one of the councillors remembered a member of their family was a special constable and declared that too. Councillors, and those appearing in-front of the committee had paper name plates, which along with the chair addressing everyone by name made sure everyone knew who each other was. (Much better than the police authority where they use first names, have no name plates, and most of the member photos on the website are a decade out of date). There was no public speaking slot on the agenda. The council had released its public speaking rules for overview and scrutiny committees the day before, and they require three days notice of a public statement or question. The minutes were discussed. I raised the question of if the date of the strategic board had changed, or if it was inaccurate. Various councillors sought to raise matters arising. It emerged there was an actions list from the last meeting but it had not been included in the meeting papers and wasn’t available at the meeting. Cllr Tierney appeared to have great faith that all the actions would indeed have been actioned and promised the actions sheet would be “made available” and there was no further discussion of matters arising. Clearly next time it would be good to have this as part of the papers. One thing I wanted to check up on was a restorative justice presentation from the police which one of the action points stated was to be distributed. I wanted to ask if it had been distributed and suggest it, and similarly circulated documents, be made public. Next up was an update on the Police and Crime Commissioner. A county council officer oddly described the role as “non political” and as having a “scrutiny function”, both of these were challenged by committee members. Almost all of the presentation and discussion was on the subject of the make-up of the Cambridgeshire Police and Crime Panel which I have written about separately. Had there been more time, a particular area of Operation Redesign I would have liked to explore is the involvement of elected councillors in the selection of local senior police officers at city/district level. As far as I know this has not occurred yet and I think it would have been good to find out when and how it is going to happen. There was also an item updating the committee on progress against recommendations it had made around a year ago on the subject of “Integrated Offender Management”. I have written an article on the aspect on which I contributed, on arranging benefits for those due to leave prison so they are not left without money and in some cases given little choice but to return if not to crime, to criminal friends for help. One of the other interesting notes was that the intervention with potential re-offenders depends on the priorities of the local Community Safety Partnerships. Better communication between prisons, the police and probation staff via an IT system called “PINS” was reported as improving awareness locally of when local people are due to be released from prison. The meeting considered the Cabinet Agenda Plan but didn’t think anything upcoming came into its remit. There was then an update from Cllr Renyolds, as the committee’s “Rapporteur” (councillor taking a particular interest in a topic) on Libraries. While I don’t know what went on in the pre-meeting I think it would be useful if the committee members focused and co-ordinated their questioning of the various people coming before them better. I have, in writing up the section on Operation Redesign, grouped the comments into three key areas: Answering the phones, Neighbourhood Policing and Restorative Justice. I think it would have been better if the chair had already agreed these key areas in advance and selected the best person to kick off the questioning on each one, allowing others to then come in afterwards to pick up any remaining matters. As it was the questioning jumped between the different areas, and every committee member acted as an individual rather than the committee as a whole acting in a co-ordinated fashion. I think the pre-meeting where councillors discuss the lines of questioning ought also be held in public. It might be appropriate to hold the public speaking slot during that element of the meeting too. I also felt those appearing before the committee, particularly those giving the oral presentations not backed up by written reports, spent too long saying what they wanted to say and not enough time answering questions on matters of interest to committee members. I would rather see shorter opening remarks and moving rapidly onto questions. The series of shorter questions and shorter answers appeared to me to be most effective at elucidating information from those appearing before the committee. Once the time taken by the answers to questions and the opening statements (presentations) was taken out of the meeting’s three hours there wasn’t that much time left each among the eleven of us to ask questions. Council Leader Cllr Nick Clarke observed some of the meeting from the public seating area. He appeared dressed in casual clothes, a multicoloured vertically striped shirt; my first thought was it could have been his pyjamas and that he might have moved into Shire Hall. Cllr Clarke is usually seen wearing a smart jacket. I did think it a bit odd that I was at the committee table with the ability to contribute while the leader of the council was in the public seating. While the public seating was at times well populated, it was councillors, and officers rather than any members of the press or public who were taking up the seats. This entry was tagged Cambridgeshire, Police, Police and Crime Commissioners on December 18, 2011 by Richard Taylor. It seems impossible to claim that the post of Police Commissioner will NOT be political as the organisation of the political parties will be used during the election.The Chief Constable must still be the person in charge as they will have the experience and in law will be reponsible for operations, not a person with no experience of policing. I make my comments as a retired police officer who held a command rank.